Those oh-so-pesky, oh-so-necessary yarn tails! What to do with them??? If you’ve decided to work in the yarn tails, you’ll need to NOT tie a knot at the beginning of your work. NOTE: I like to work the tail in all the way across the whole row so it looks like part of the design. 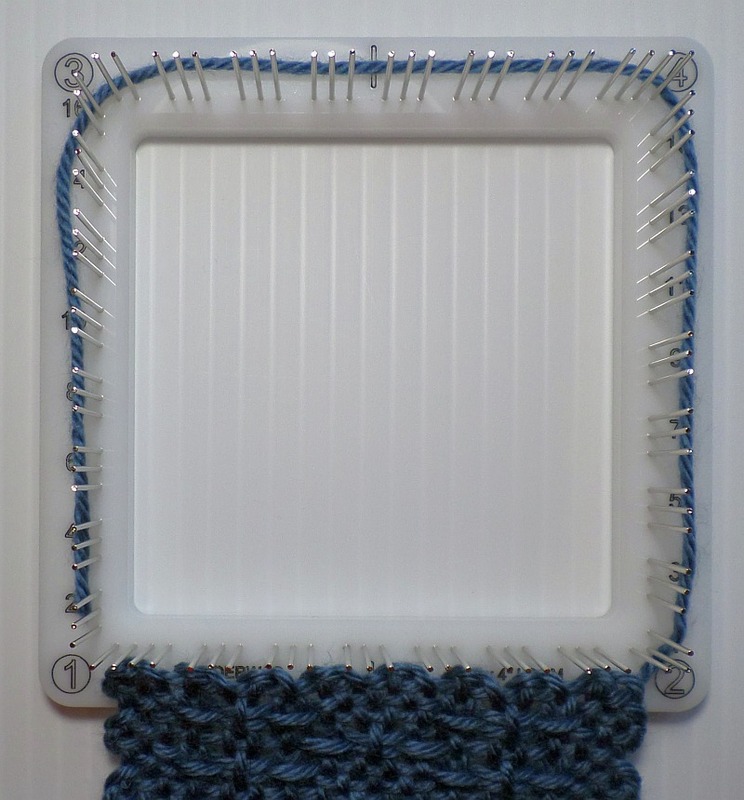 Measure off a length of yarn a little bit wider than one side of the frame. Begin warping L1 WITHOUT tying a knot. Just let the yarn hang loosely in place. Hold it with your thumb till you get a few warps in place. After that it should hold itself. Stop at Cr2. Take the ending yarn tail and wrap it counterclockwise around horizontal pin #1 at Cr1. 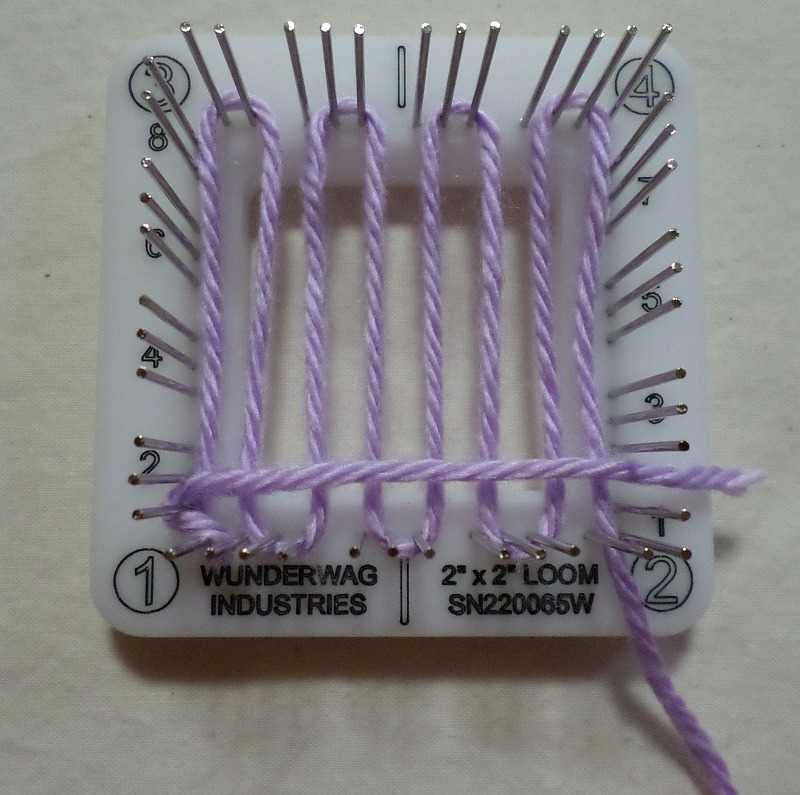 Now take the same beginning tail clockwise around the first vertical pin at Cr1 (#1 on the 1-3 side of the loom). The yarn tail has formed a figure 8. 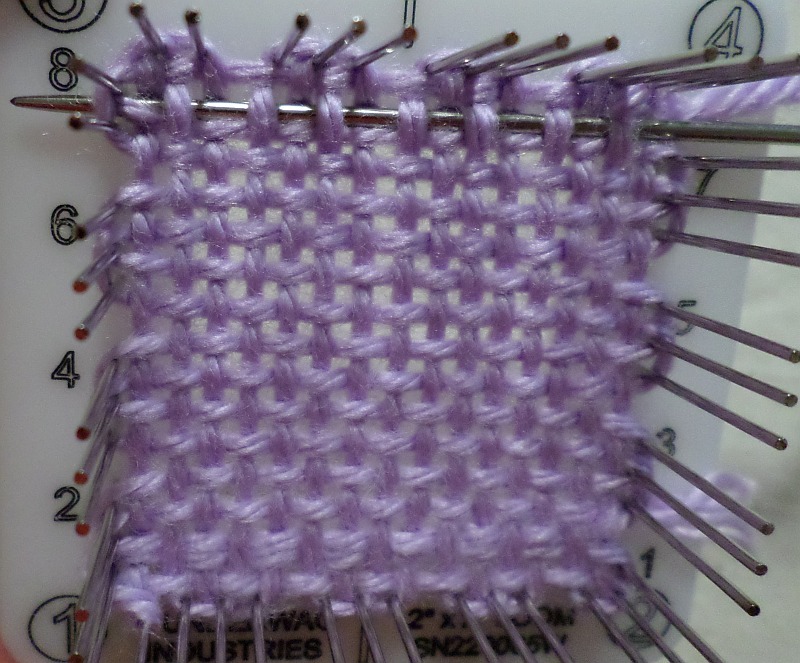 Bring the tail straight across the loom so it lies in place horizontally. The tail will be resting above the third pin of the Cr2 three-pin group. Keep the figure 8 twist a little bit loose for now. Now you’ll begin warping L2. 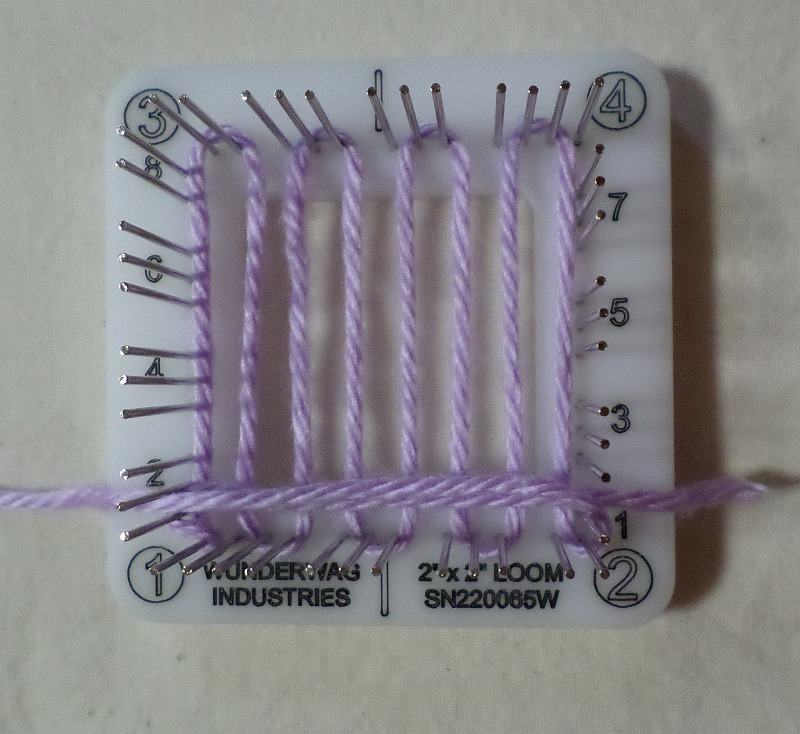 Notice that the first L2 strand will lie on top of the beginning yarn tail. They’re going to share that row space as though they were one strand. Continue warping L2 as usual. In fact, go ahead and warp L3 as well. 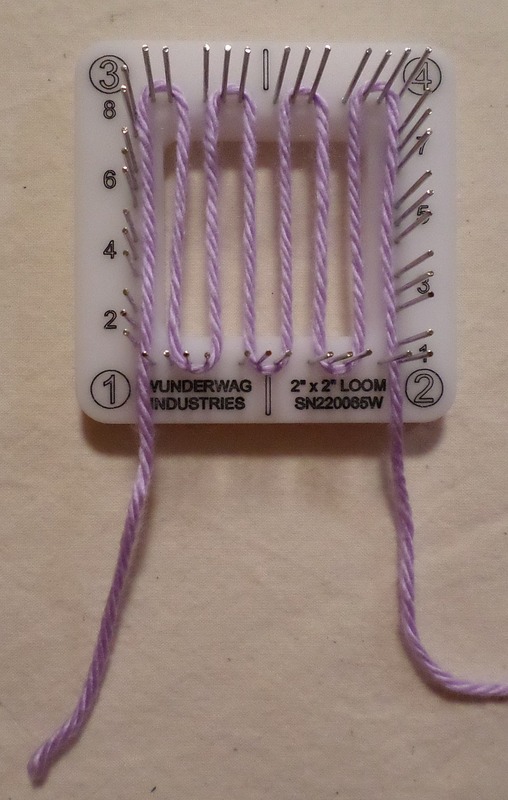 Wrap the yarn around the loom the required number of times (3x for 2″, 5x for 4″, 7x for 6″). 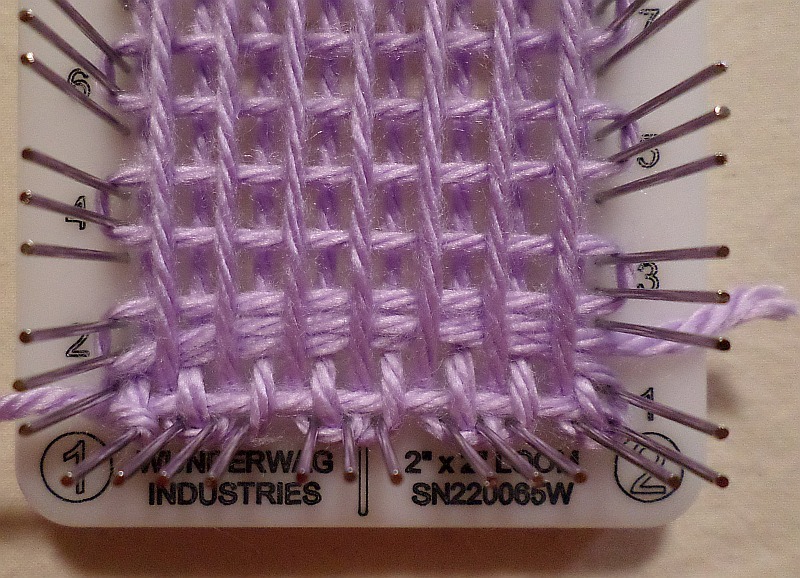 Cut yarn, thread needle, and get ready to weave. 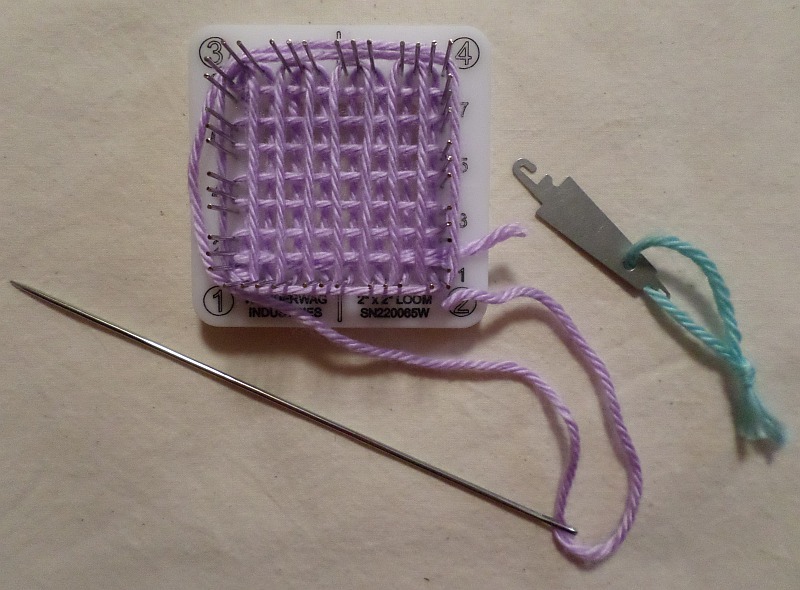 I’ve included my favorite needle threader in the photo, in case anyone is interested. For the next step, the trickiest one, I’ve included the same photo twice—the first is the plain photo; in the second I doctored it so you can see the action of the needle a little better. (It’s really hard to get photos of some of these procedures!) Weave row 1 (R1) as usual till the very end. 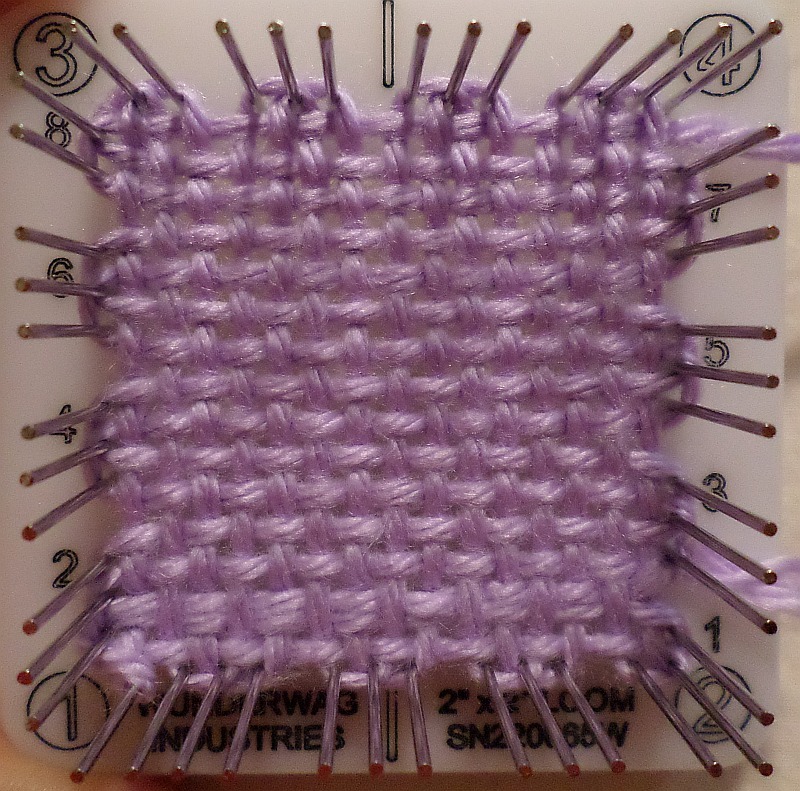 As you finish weaving R1, take the needle Under the last warp (as you usually would), but then go Over the outer tail loop. You’re actually going through the top loop of the figure 8. Fingernails come in handy here. Here’s a look at R1 after the needle has been pulled through. That’s how you take care of the beginning yarn tail. Another option is to leave it hanging in place (without the figure 8 maneuver), then weave it in before you take the square off the loom. In such a case, you can follow the path of L4, R1 and weave along the lower outer edge OR follow the path of L2, R1 and weave horizontally above the lower edge OR follow the path of one of the vertical warps—when using two colors I work the L1 and L3 tails in vertically (see Additional Resources below). The trick is to not weave the end in on either the horizontal or vertical outside edge by going opposite the strand you’re weaving next to. 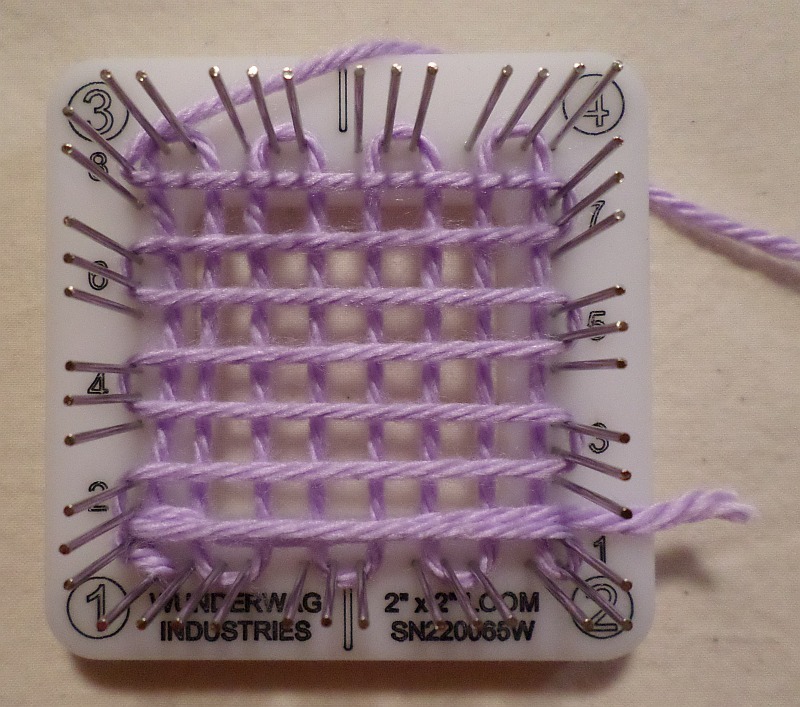 If you do this and then remove the square from the loom, you’ll find the tail isn’t worked in. 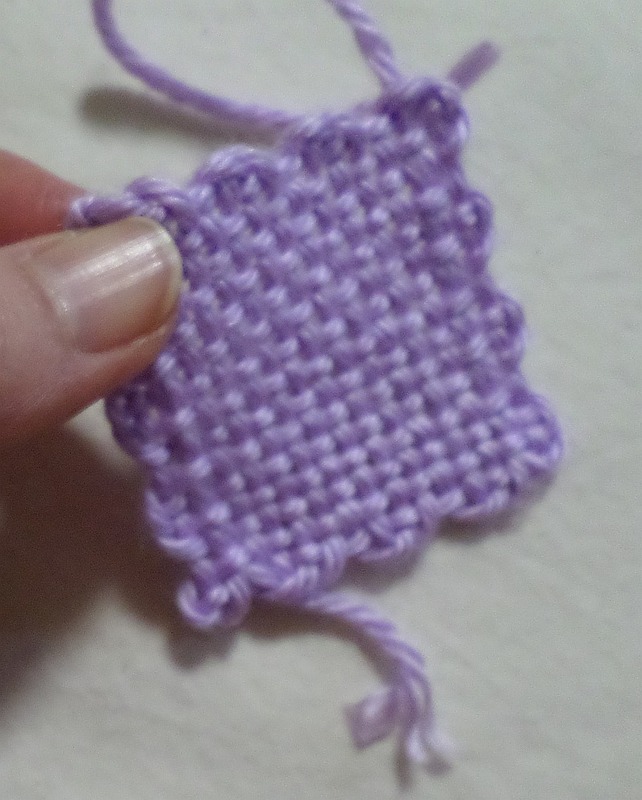 Also, if your work will only show on one side, you can weave the tail in loosely across the back of the square. This keeps it almost entirely invisible. The two halves of this star will be joined with right sides in, so ends can be lightly tacked out of sight. 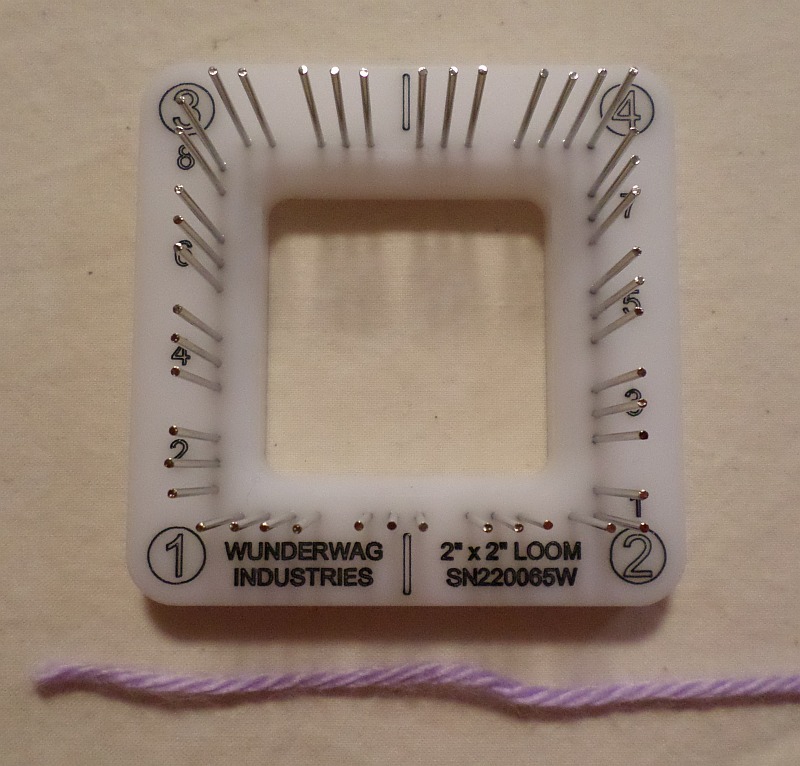 Reminder: this is the end many people use for sewing their squares together. You can work the tail in vertically or horizontally. 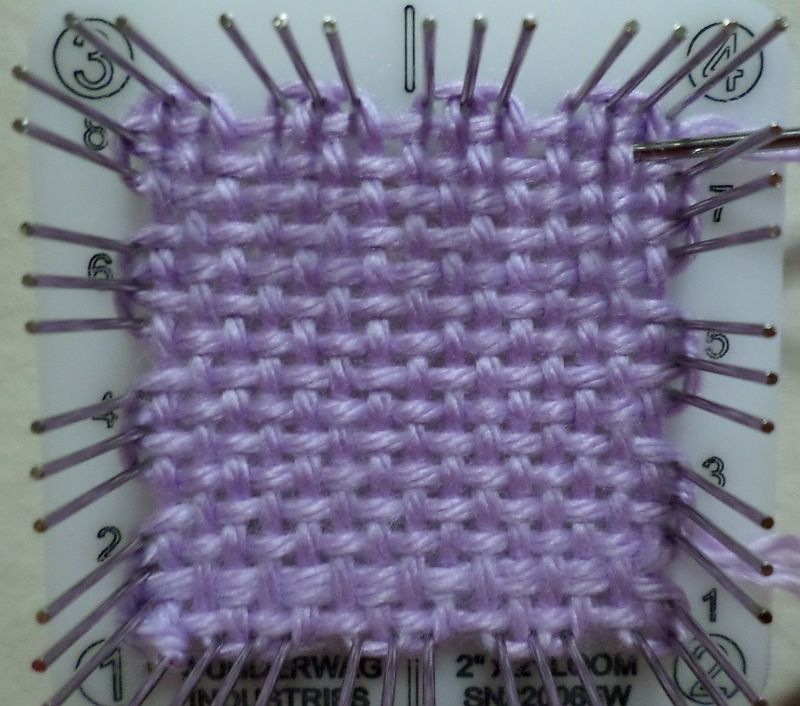 If working the tail in along the outer edge, don’t weave opposite to the outer strand, follow its same path or the worked-in end will pull right out when you remove the square from the loom. 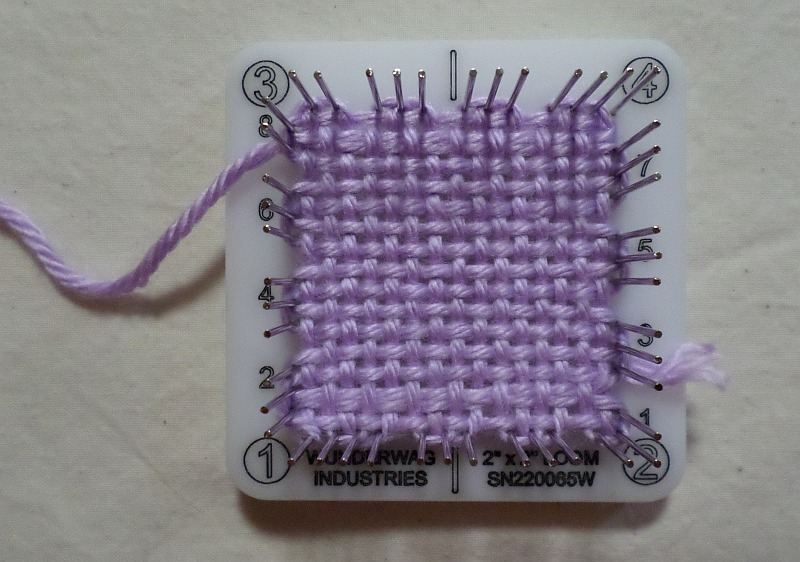 This demo will show how to work the tail in horizontally while the square is 1) on the loom and 2) off the loom. 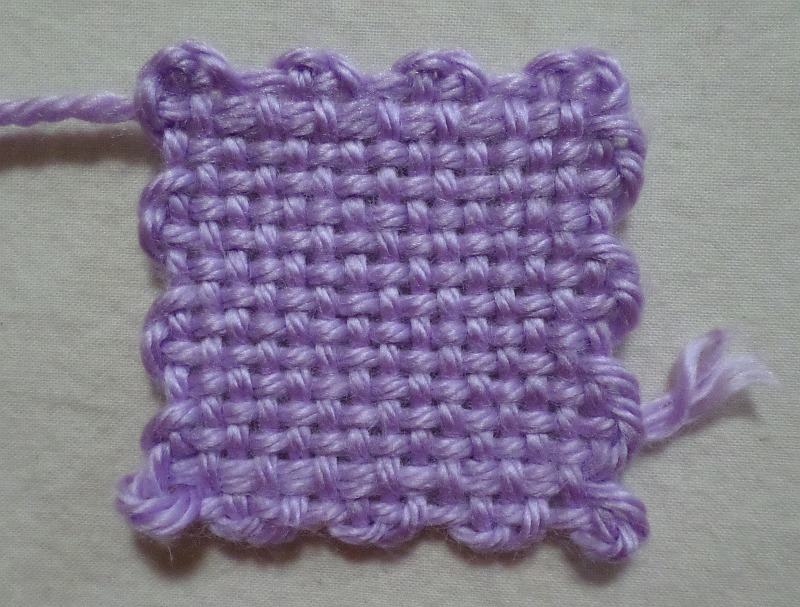 You’ve finished weaving the square. The tail is at Cr4. Finished square before tail is worked in. 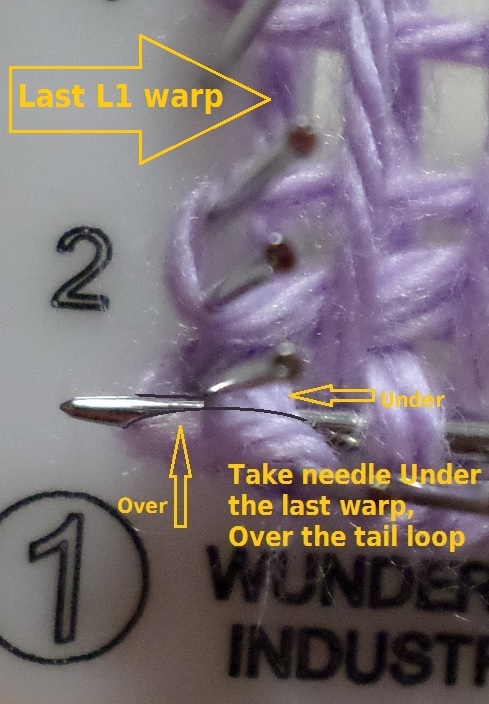 Begin working in the tail by taking the needle Over the last warp. Follow the path of the last L2 weft. 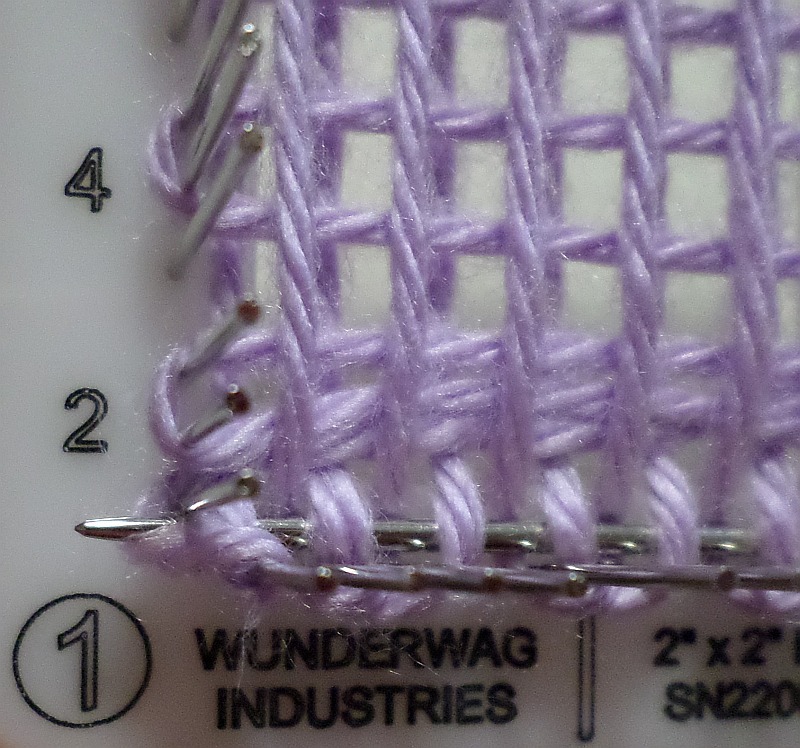 NOTE: If you wanted to work the tail in horizontally along the outside edge, you’d bring the needle Over the last two warps, then follow the weaving path of L4’s last row. At the very end of the row I go under both the outer loops. Photo 1: Pull the worked-in end very tight. Notice how the warp gets pulled into the square. Photo 2: Use the needle to loosen up the too-tight area. 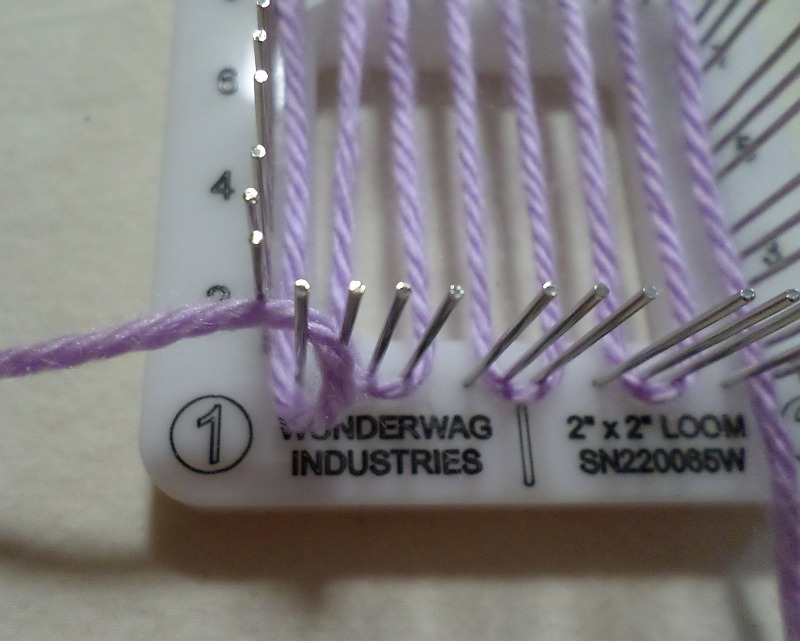 Photo 3: The end is now worked in with even tension along the row. 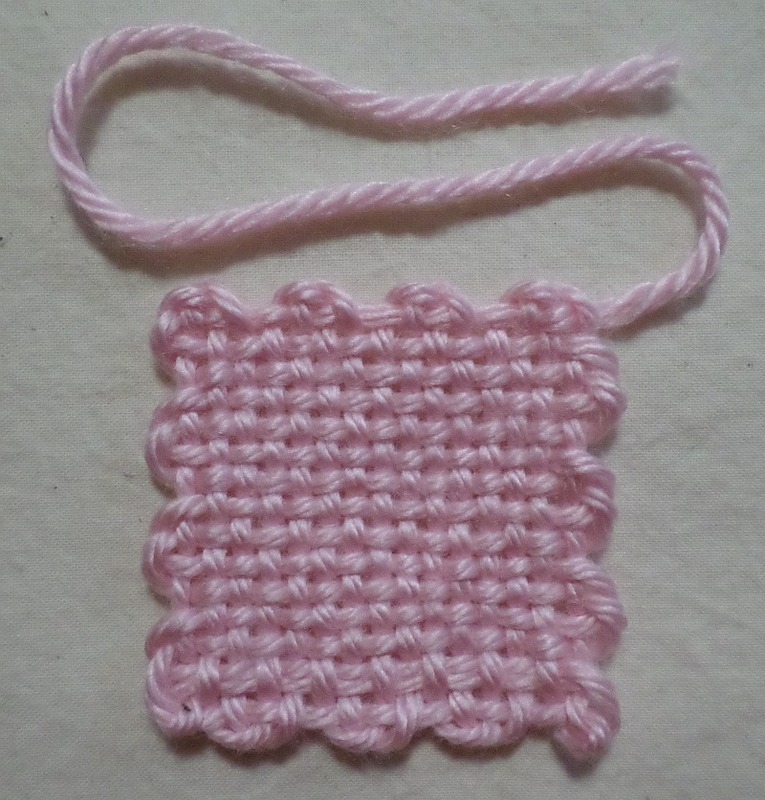 Finished square on the loom with both ends worked in. The almost finished square. Notice at Cr1 the figure 8 has left an unsightly loop. Gently pinch Cr1 while tugging the tail (located near Cr2). This should make the loop disappear. We also see a pink square that has its end worked in. 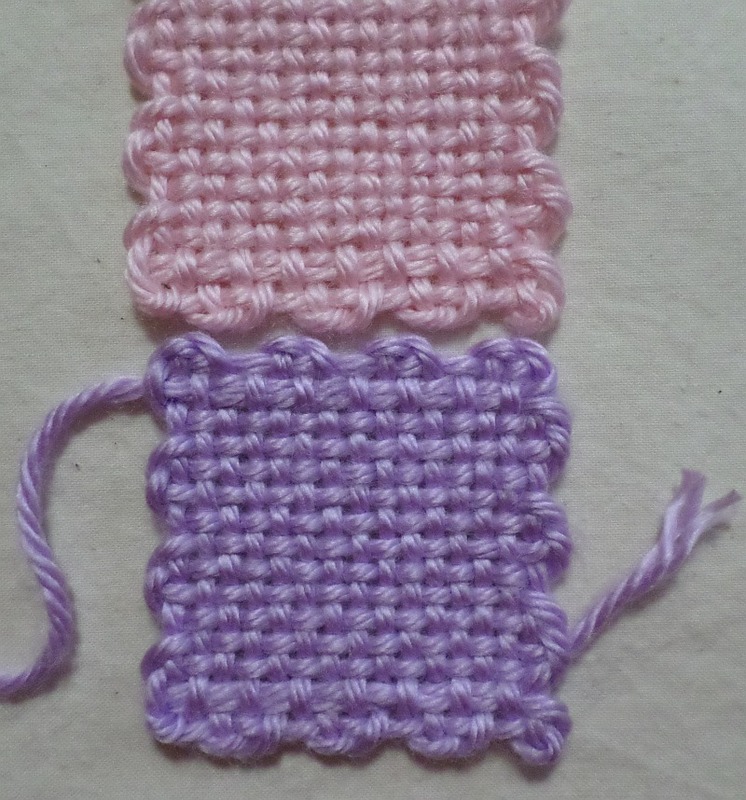 You may not notice the subtle difference, but the pink one’s end wasn’t caught into the weft loop between R2 and R3, while the lavender square’s was. 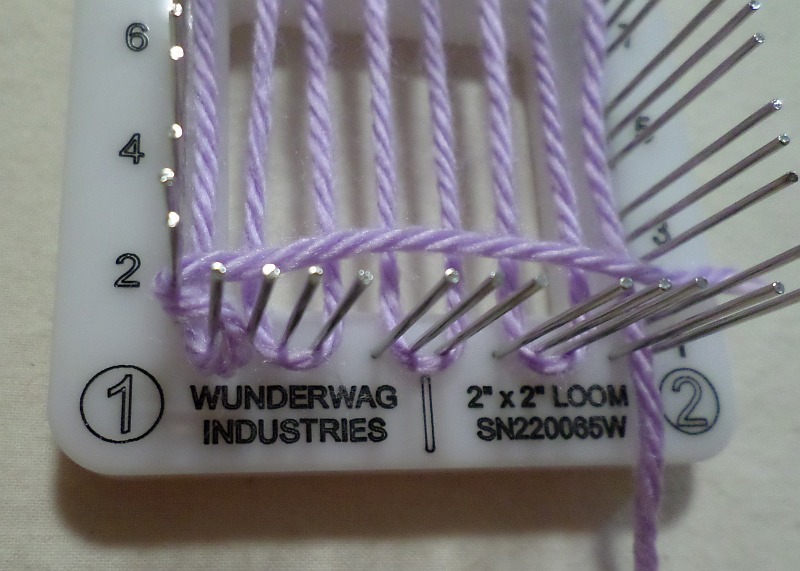 You can work ends in vertically or horizontally both on and off the loom. 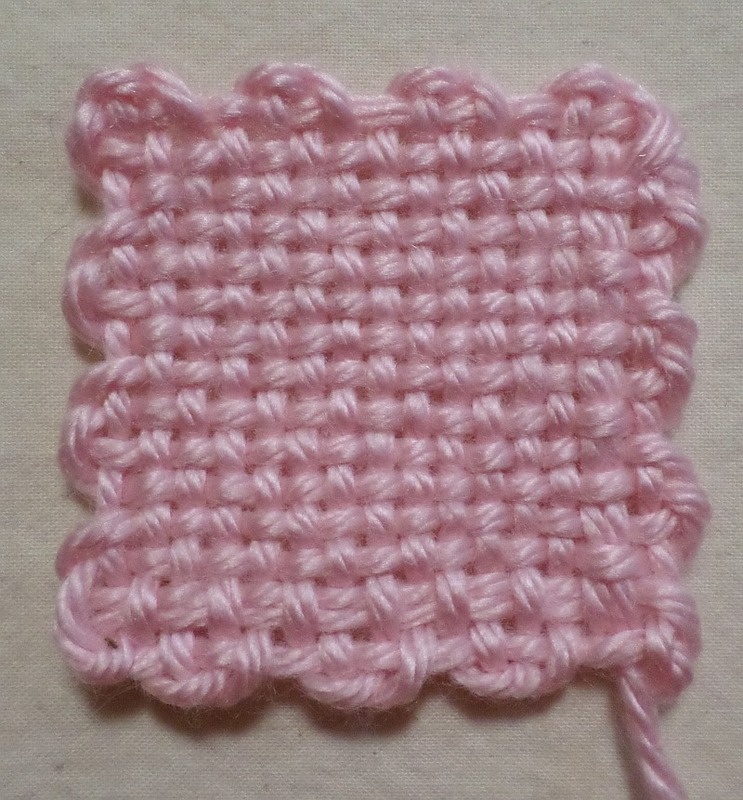 Here’s the pink square with its final end not yet worked in. Take the needle Over the top two wefts, then Under, Over . . . following the path of the second-to-last warp. 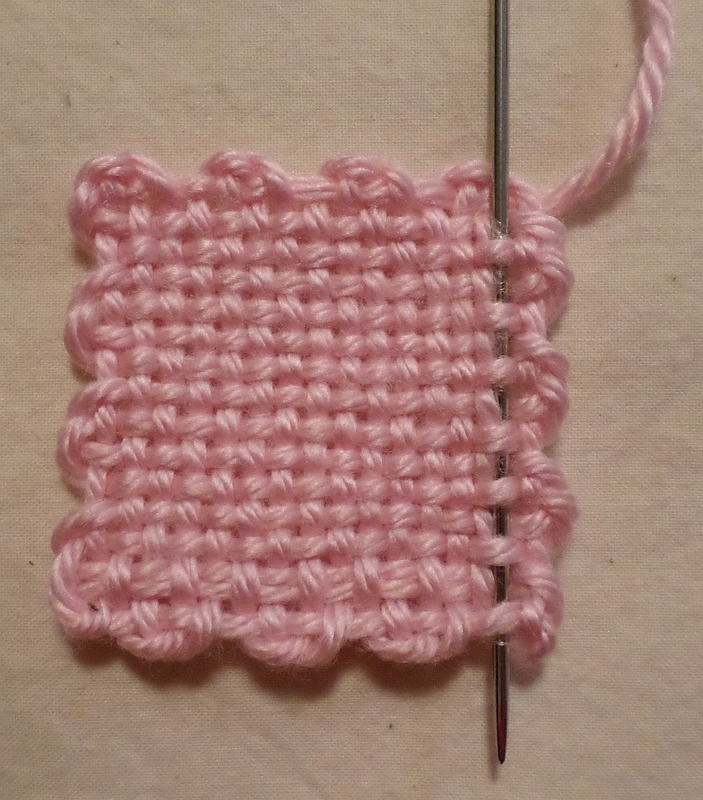 Finished square with ends worked in—first one is horizontal, last one is vertical. ADDITIONAL RESOURCES — Two of the blog posts and the second video are somewhat complicated, but you might find them helpful when you want to use more than one color. They’re my older work, so I still had a lot to learn when I wrote and filmed them. I would like to try the 2-sided dimensional star. Is there a pattern available for it?